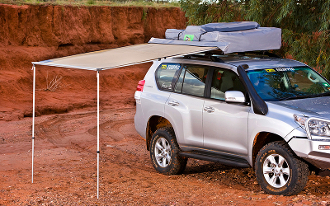 The TJM awning is so easy to set up that you don’t have to wait to go camping. It provides the ideal UV shade for sport spectating, BBQ's or day trips. Available in two sizes, the shade is self-standing, height adjustable and easy to setup. Completely waterproof, the PVC coated polyester shade provides the perfect weather protection. 2000mm wide by 2100mm deep in size. Self standing, height adjustable & very easy to deploy. PVC coated polyester shade cover provides UV protection & is completely water resistant. Guy ropes & pegs supplied for windier conditions. Awning secured in durable nylon reinforced PVC bag.